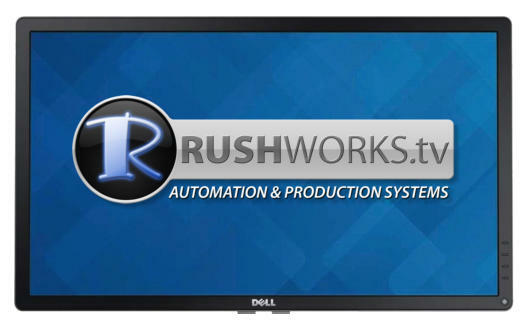 Ctrl+R is the software module embedded in VDESK and REMO, and available as a standalone utility for controlling PTZ cameras, video switchers, RUSHWORKS PTX Universal PanTilt heads and the RUSHDOLLY. Using VISCA commands and connectivity you can control up to 12 serial or IP PTZ cameras, and PTX fixtures. Take advantage of advanced control features like Dynamic Auto Zoom and Motion Presets. Control of the RUSHDOLLY is also integrated, making this bundle a perfect addition to any video switcher. The Ctrl+R application runs on Windows 7, 8 or 10 devices. It includes a RUSHWORKS USB to RS422 4-port MUX and four DEMUXES that provide RS422 serial control and 12VDC to PTZ cameras. It uses VISCA command protocol for the cameras, as well as for RUSHWORKS PTX Universal PanTilt heads. A 6-button joystick is also included. 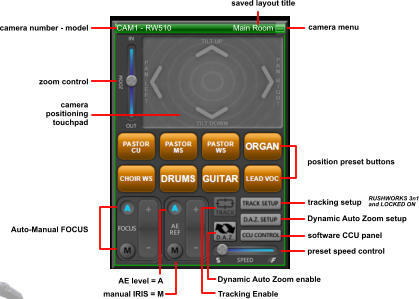 * It utilizes the CLASSIC User Interface which provides 8 user named and saved presets for each camera/fixture. Ctrl+R replaces traditional hardware controllers with versatile and scalable software control that lets you create, name and save presets. Access shots instantly using a touch screen, mouse or keypad. We integrate zoom, focus and iris controls into our camera control software … as well as complete control of cameras that support VISCA protocol. Put Your CAMERAS IN MOTION!